After returning home to Dallas, I immediately applied my business skills to supporting women via SCORE and WINGS. I have continually focused my energy on developing innovative programs for women, veterans and small business owners—turning visions into realities as the Founder and Executive Director for the Veteran Women’s Enterprise Center (VWEC), a national initiative that has broken ground in southern Dallas as the first of many VWECs projected for Texas and our nation. I have been building strategic alliances and providing innovative technical assistance for nearly 20 years, with a history of success helping nonprofits, businesses and associations access the resources they need to succeed. As an advocate for women veterans, I proudly testified in support of the original House Bill to make June 12, Women Veterans Day in Texas; and in collaboration with the groundbreaking for the VWEC, I organized the Women Veterans Day 2017 Celebration supported by women veterans across our region. In 2018, I Chaired the Dallas Planning Committee for the first official Women Veterans Day in the State of Texas; celebrating the 70th Anniversary of the 1948 Women’s Armed Services Integration Act, collaboratively hosting a series of Dallas events. Committed to advocacy for women and small businesses, I serve on the Advisory Committee for Texas Woman’s University, Center for Women in Business. I am a Fellow at Southern Methodist University, Hunt Institute for Engineering and Humanity as a part of their Inclusive Economy. Furthermore, I am humbled to have been selected for the Dallas Public Voices 2019 Cohort. Actively involved in veteran support, I serve on the 30th Congressional District Veteran Advisory Committee and support the efforts of various local veteran coalitions and service organizations. I served as the Chair of the Veteran Business Subcommittee for the City of Dallas, Office of Business Diversity and as the 2017 VP for Veteran Affairs with SCORE Dallas. 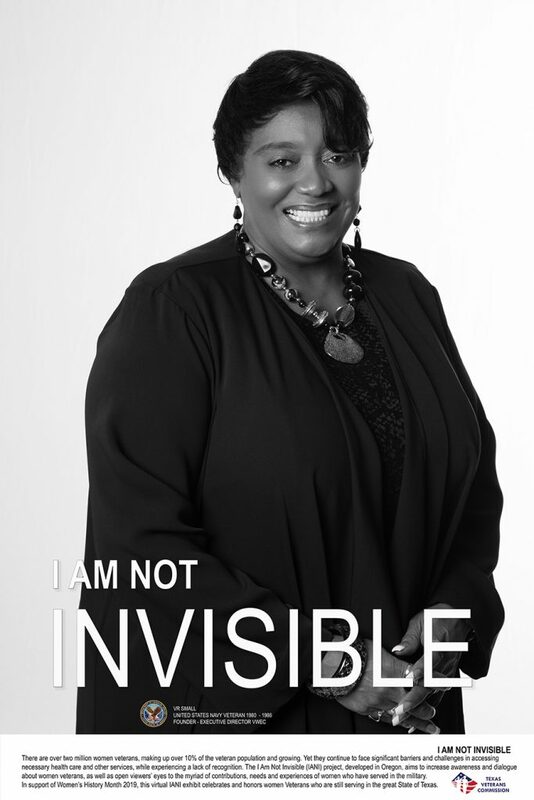 Most importantly, I am a U.S. Navy Veteran, proud stepdaughter and sister to U.S. Army Vietnam & Iraq Veterans, respectively, and I am not invisible!